• the method of potable water treatment by means of the irradiation with ultraviolet is the most modern and effective means. The equipment which is now employed in Russia is insufficiently effective for the destruction of spore-forming bacteria, viruses, fungi, algae, and moulds. The current Russian standards for UF flux densities of 16 – 20 mJ/cm2  and of 28 – 30 mJ/cm2 for domestic and industrial sewage do not provide the effective inactivation of pathogenic microflora. Moreover, an increase in the resistance of microflora with respect to the action of chlorine, ozone, and ultraviolet should be also taken into considerations. This circumstance relates to the natural evolution process. Microbiologists in the leading scientific centers of America, Asia, and Europe point to the fact that over the last 15 - 20 years the resistance of the pathogenic microflora to the action of chlorine has grown by 5 times, to the action of ozone – by from 2 to 3 times, and to the action of UV irradiation – by 4 times. This fact means that, with due account for a further increase in the resistance of spore, virus, and protozoa microorganisms to the aforementioned factors of water and sewage disinfection, it is necessary to set such effective levels in designing of specific systems, which take into consideration the dynamics of the above mentioned resistance growth. This is the reason behind the fact that in economically developed countries the standard minimal dose of UV radiation has been set to be no less than 40 mJ/cm2, and, for newly designed stations of water and sewage treatment, the dose of UV irradiation is planned to be from 70 to 100mJ/cm2. With due account for these reasons and also with the purpose of further decrease of specific energy consumption for the disinfecting of water and sewage, the ever growing interest is paid to the development of the effective methods of combined action of different physical and chemical disinfecting means and techniques. One of such combined methods of water/sewage treatment comprises the simultaneous action of ultrasound and ultraviolet on water; this method is known under the name of “Lazur” technology. the was developed in the mid 90-th of the last century; this methods makes use of simultaneous action of ultrasound and ultraviolet to a medium being treated. The corresponding technology based on this method was conventionally named as “Lazur” It makes use of the simultaneous treatment of water/sewage by the UV irradiation at the wave lengths of 253.7 and 185 nm at the flux density of no less than 40 mJ/cm2 and by the action of ultrasound at a power density of about 2 W/cm2 as well as by and by acoustic vibrations. This method was patented in the Russian Federation in 1996. Since 1997, the proposed technology was successfully implemented and tested in the modular type bactericidal units of “Lazur-M” series. In the course of treatment of the passing water flow by the ultrasound from a transducer arranged directly inside the body of the photochemical reactor, short-living vapor-gas cavities are generated. They appear in water at a moment of local decompression and then close with a microburst upon the compression of water on microinhomogenieties inside the volume of the unit body with a frequency of several tens kHz. Due to the local sharp changes in pressure and temperature in the treated water, the pathogenic microflora is completely destroyed. In the course of this process, fungi spores and bacteria serve as the aforementioned microinhomogenieties and thus become treatment targets. In addition, active chemical radicals and hydrogen peroxide are formed. OH radicals are very powerful catalysts, which are able to increase the disinfecting effect of UV irradiation by several orders of magnitude. Moreover, the action of ultrasonic radiation in the volume of liquid under treatment brings about the process of the volume degassing, that is, the appearance of multiple microscopic air bubbles. Fig. 1. 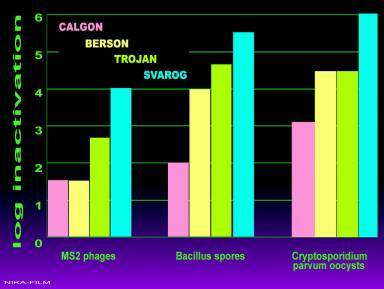 The comparison of effectiveness in the inactivation of the main groups of pathogenic microflora on “Lazur-M” units of the SVAROG Company with the effectiveness of equipment produced by the leading world companies CALGON, BERSON, and TROJAN. The main technical and economic characteristics are given in the Table. 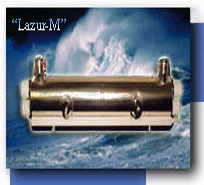 Such effectiveness of “Lazur” units makes it possible to ensure the undoubted reliability of disinfection at a level of 99.9999% for the nearest 20 – 30 years at commensurable expenses required for the construction of water and/or sewage stations that makes them attractive for any customer. As follows from the comparison of basic characteristics of the “Lazur M-250” unit, on the one hand, and OS-36A, OS-72A, and UDV-288 units produced by the LIT Company, on the other hand, the main features such as the cost, energy consumption, weight and overall dimension parameters, effectiveness, and operation expenditures testify for the superiority of “Lazur-M” series units. Appreciably lower demands with regard to the water transmittance (down to 50%) and to the amount of suspension particles (to 20 mg/l) and the lack of necessity in periodic cleaning of protective casings from the products of biofouling and solarization (the corresponding functions of a laundry washer are fulfilled by the ultrasonic vibrations of the cavitators) are obviously the significant advantages of these units. To summarize the above said, it may be mentioned, that now the new regulations are elaborated for water and sewage treatment; the Sysin Institute of Human Ecology and Environment Hygiene, the authorized Russian institution for the standards and regulations relating to sanitary and bactericidal technologies and means, is preparing documents for the revision of the methodic guidelines relating to the use ultraviolet disinfecting devices for the purification of potable water, sewage, and other aqueous media. With that, the minimal dose of UV irradiation should be set at a level of no less than 40 mJ/cm2 for the natural potable water and sewage. This circumstance should be specially taken into consideration when designing the new industrial and housing objects of water/sewage treatment. It should be emphasized, that despite the reliably established experimental fact of the existence of toe synergetic effect under the conditions of simultaneous combined action of ultraviolet and ultrasound on water [11 – 14], the process itself still remains little-studied. This circumstance is explained by the multiple-factor character of the process, principle difficulties in its modeling in vitro , differences in the behavior of various types of pathogenic microorganisms and in the techniques of preparing of microbiological samples for experiments (the degree and parameters of dispersing, the estimates of dilution, etc.). Moreover, the experiments are very costly, laborious, and long-continued. Nevertheless, the deeper knowledge of the mechanisms and interrelations of basic parameters of the process in point will allow one to optimize both hardware and technological regimes with regard to the most strict requirements of water and/sewage disinfection. The Full Member of the World Academy of Sciences of the Overall Safety.